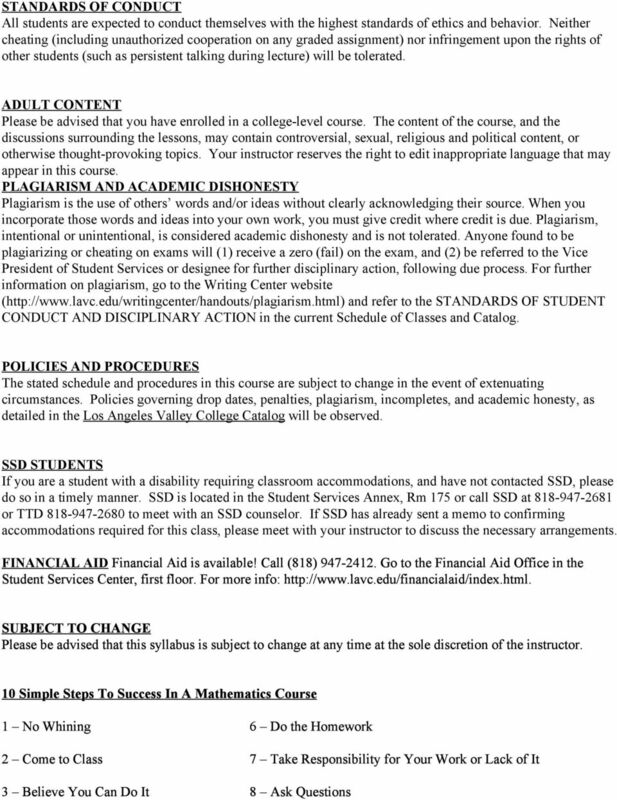 Download "LOS ANGELES VALLEY COLLEGE MATH 275. Ordinary Differential Equations (section #9502 3.00 units) S16. MW 9:40 11:05a MS 108"
1 LOS ANGELES VALLEY COLLEGE MATH 275 Ordinary Differential Equations (section # units) S16 MW 9:40 11:05a MS 108 Instructor: Shanna Dobson Office: MS 112 _ Phone: (x8507) Office Hours: M a PREREQUISITE recommended. A grade of C or better in MATH 267, or concurrent enrollment in MATH 267 and enrollment via STEM program. A grade of C or better in MATH 270 is also COURSE DESCRIPTION A study of first order and linear differential equations. Special methods for the solutions of these equations developed and applied. Laplace transform and inverse Laplace transform are developed and applied. Power series solutions and linear systems of differential equations are included. OBJECTIVES AND STUDENT LEARNING OUTCOMES Upon successful completion of this course, students will be able to: develop notations and terminologies relevant to the study of differential equations; solve first order differential equations and special differential equations, such as Bernoulli equations; solve linear differential equations and nonlinear reducible differential equations and applications such as the Green Cauchy differential equation; define Laplace transform and obtain Laplace and inverse Laplace transforms with their applications in solving initial value problems; solve systems of linear first order differential equations using matrix theory; think analytically about higher level mathematical concepts in order to solve differential equations; analyze and solve differential equations using myriad techniques including calculus based strategies. TEXTBOOK Differential Equations with Boundary Value Problems, Polking, Boggess, and Arnold, Pearson Prentice Hall 2 nd Ed., 2012 (REQUIRED). ISBN: UNITS OF INSTRUCTION Chapter 2: 2.1, 2.2, 2.4, ; Chapter 5: ; Chapter 9: , ; Chapter 4: ; Chapter 8: ; Chapter 11: ; METHODS OF EVALUATION 2 in class midterm examinations 60% 1 in class final examination (cumulative) 40%. 1 optional Extra Credit Project (TBA) PERCENT LETTER GRADE PERCENT LETTER GRADE A C B D 0 59 F Grades will NOT be curved, skewed, or otherwise inflated. No re tests or extra credit will be given. 2 HOMEWORK Homework will be assigned but not collected. Additionally, each of the odd exercises in the textbook should be completed. To achieve a high degree of mastery of the course material, it is suggested that students average at least 2 hours of study for each hour of class time. ATTENDANCE POLICY Attendance at all regularly scheduled class meetings is expected. Attendance at all examinations is required. In the case of absence, it is the student s responsibility to determine what material or class activities he/she may have missed and to take appropriate action as soon as possible. Please be advised that after the census week it is solely the responsibility of students to drop themselves from the course if necessary. Failure to officially withdraw from a course may result in the student s receiving a failing grade. If you stop attending the class or wish to drop the class you must drop yourself officially through the Office of Admissions and Records by phone or via the internet. The only students who may attend class are those who have been admitted to the college and are in approved active status and who are registered for the class. Students are expected to attend every meeting of all classes for which they are registered. Violation of this will result in exclusion from this class as specified in Administrative Regulation E 13. Provisions of Administrative Regulation E 13 include the following: 1. Students who have registered for a class and who do not attend the first meeting of the class forfeit their right to a place in the class. 2. 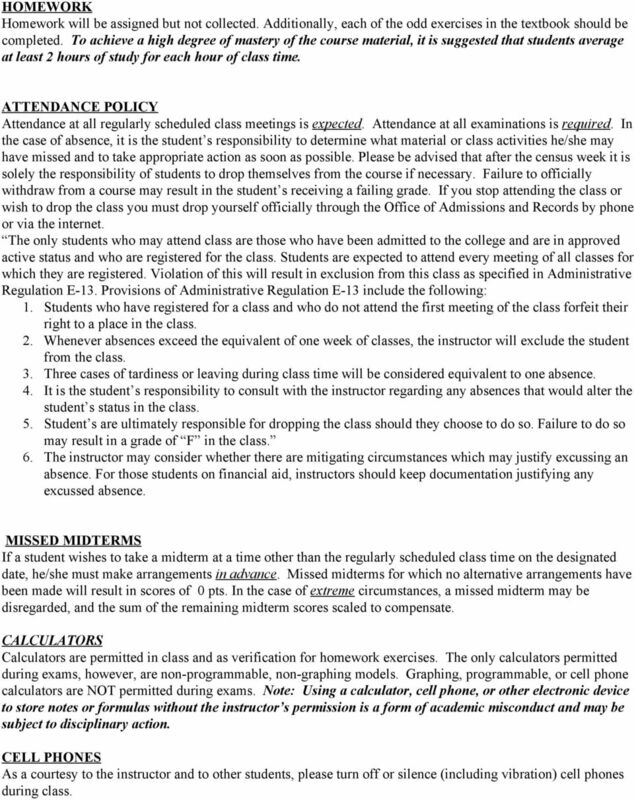 Whenever absences exceed the equivalent of one week of classes, the instructor will exclude the student from the class. 3. Three cases of tardiness or leaving during class time will be considered equivalent to one absence. 4. It is the student s responsibility to consult with the instructor regarding any absences that would alter the student s status in the class. 5. Student s are ultimately responsible for dropping the class should they choose to do so. Failure to do so may result in a grade of F in the class. 6. The instructor may consider whether there are mitigating circumstances which may justify excussing an absence. For those students on financial aid, instructors should keep documentation justifying any excussed absence. MISSED MIDTERMS If a student wishes to take a midterm at a time other than the regularly scheduled class time on the designated date, he/she must make arrangements in advance. Missed midterms for which no alternative arrangements have been made will result in scores of 0 pts. In the case of extreme circumstances, a missed midterm may be disregarded, and the sum of the remaining midterm scores scaled to compensate. CALCULATORS Calculators are permitted in class and as verification for homework exercises. The only calculators permitted during exams, however, are non programmable, non graphing models. Graphing, programmable, or cell phone calculators are NOT permitted during exams. Note: Using a calculator, cell phone, or other electronic device to store notes or formulas without the instructor s permission is a form of academic misconduct and may be subject to disciplinary action. CELL PHONES As a courtesy to the instructor and to other students, please turn off or silence (including vibration) cell phones during class. 5 Math Department Brochure The Valley College Mathematics Department wants every student in each math class to have the maximum opportunity for success. 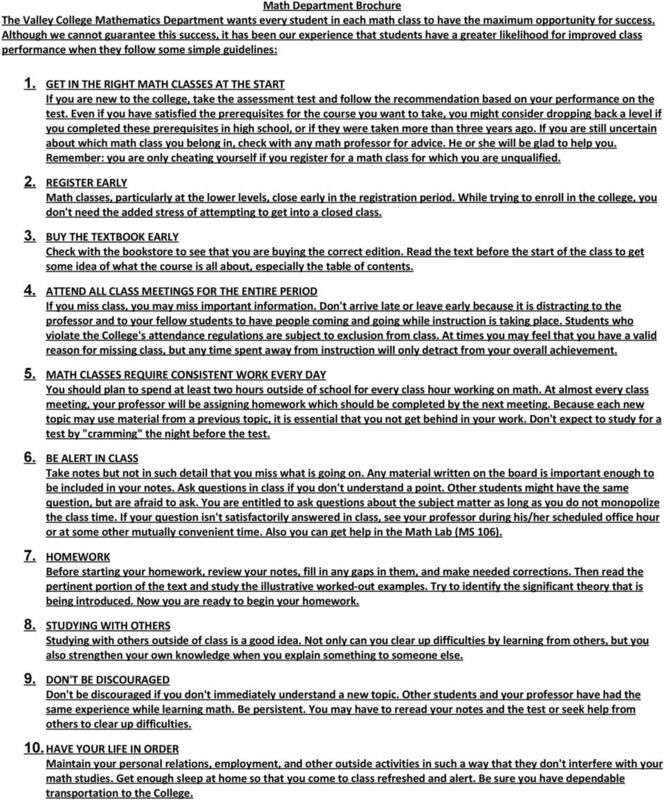 Although we cannot guarantee this success, it has been our experience that students have a greater likelihood for improved class performance when they follow some simple guidelines: 1. GET IN THE RIGHT MATH CLASSES AT THE START If you are new to the college, take the assessment test and follow the recommendation based on your performance on the test. Even if you have satisfied the prerequisites for the course you want to take, you might consider dropping back a level if you completed these prerequisites in high school, or if they were taken more than three years ago. If you are still uncertain about which math class you belong in, check with any math professor for advice. He or she will be glad to help you. Remember: you are only cheating yourself if you register for a math class for which you are unqualified. 2. REGISTER EARLY Math classes, particularly at the lower levels, close early in the registration period. While trying to enroll in the college, you don't need the added stress of attempting to get into a closed class. 3. BUY THE TEXTBOOK EARLY Check with the bookstore to see that you are buying the correct edition. Read the text before the start of the class to get some idea of what the course is all about, especially the table of contents. 4. ATTEND ALL CLASS MEETINGS FOR THE ENTIRE PERIOD If you miss class, you may miss important information. Don't arrive late or leave early because it is distracting to the professor and to your fellow students to have people coming and going while instruction is taking place. Students who violate the College's attendance regulations are subject to exclusion from class. At times you may feel that you have a valid reason for missing class, but any time spent away from instruction will only detract from your overall achievement. 5. MATH CLASSES REQUIRE CONSISTENT WORK EVERY DAY You should plan to spend at least two hours outside of school for every class hour working on math. At almost every class meeting, your professor will be assigning homework which should be completed by the next meeting. Because each new topic may use material from a previous topic, it is essential that you not get behind in your work. Don't expect to study for a test by "cramming" the night before the test. 6. BE ALERT IN CLASS Take notes but not in such detail that you miss what is going on. Any material written on the board is important enough to be included in your notes. Ask questions in class if you don't understand a point. Other students might have the same question, but are afraid to ask. You are entitled to ask questions about the subject matter as long as you do not monopolize the class time. If your question isn't satisfactorily answered in class, see your professor during his/her scheduled office hour or at some other mutually convenient time. Also you can get help in the Math Lab (MS 106). 7. HOMEWORK Before starting your homework, review your notes, fill in any gaps in them, and make needed corrections. Then read the pertinent portion of the text and study the illustrative worked-out examples. Try to identify the significant theory that is being introduced. Now you are ready to begin your homework. 8. STUDYING WITH OTHERS Studying with others outside of class is a good idea. Not only can you clear up difficulties by learning from others, but you also strengthen your own knowledge when you explain something to someone else. 9. DON'T BE DISCOURAGED Don't be discouraged if you don't immediately understand a new topic. Other students and your professor have had the same experience while learning math. Be persistent. You may have to reread your notes and the test or seek help from others to clear up difficulties. 10. HAVE YOUR LIFE IN ORDER Maintain your personal relations, employment, and other outside activities in such a way that they don't interfere with your math studies. Get enough sleep at home so that you come to class refreshed and alert. Be sure you have dependable transportation to the College. 6 11. MISCELLANEOUS You may not believe it, but every math professor wants you to succeed in his/her class. All of us went into math teaching because of a sincere desire to help others. If you find that for some reason you are not getting along with your professor, see the person privately in an effort to resolve the difficulty. If this meeting does not settle the problem, then see the Department Chairperson. However, to criticize the professor in class or in some other public setting is discourteous and will probably make getting what you want less likely. 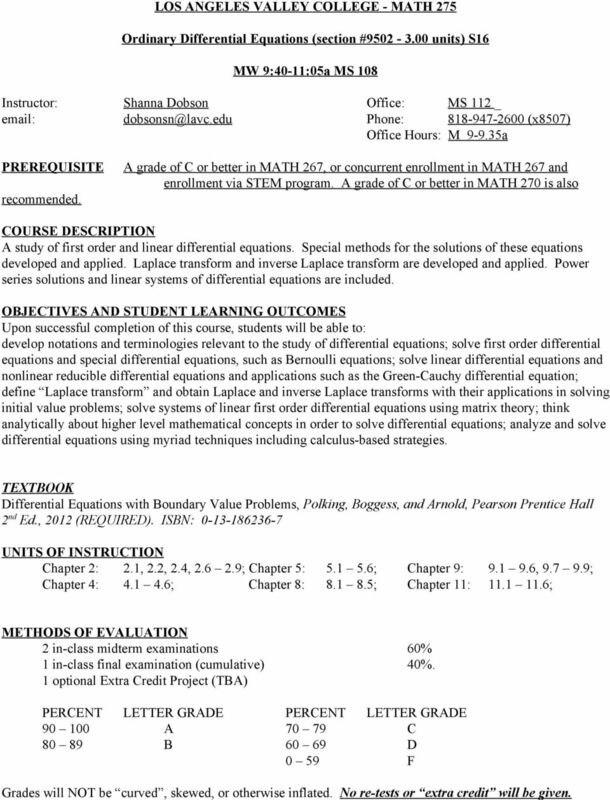 MATH 2320 Differential Equations Frank Phillips College General Course Information Credit Hours: 3 General Education Core Curriculum Course Prerequisite Completion of MATH 2315 with a grade of C or better.